The in-salon Phillip Kingleys treatment involves a scalp therapy that will be applied by one of our team. Then the elasticise will be applied to the mid lenghts and ends. The product will then be massaged into the scalp, this will help re-energise scalp to aid your hair growth, by stimulating the sebaceous glands. This gets the blood flowing to the head and hair. You will also receive a refreshing neck and head massage to drain any toxins and relax you lasting 5 minutes. Next you will be placed under heat for 15-20 minutes, once complete your stylist will take you over to the basin and massage your scalp further before doing two shampoos with one of the Phillip Kingley shampoos, then a final condition combed all the way through and rinsed well ready be dried. Options of a free blast dry or a blowdry by your stylist as a extra cost which changes depending on the stylist you have booked with. We offer this treatment alongside the Phillip Kingsley treatment or other hair treatments and on it’s own with oils. You can now book a 15 minute head massage with one of our beauticians, once the Phillip Kingsley treatment has been applied. This will take place in the beauty room and will really get the blood flowing to your hair follicles which helps new hair growth and also is really relaxing. Please allow extra time for this treatment. If your feeling like you need a little pampering why not check out our price list for other massages and facials while your hair treatment is on. For more information please don’t hesitate to call us and ask to speak to Natalie our beautician, or one of our senior stylists. Everyone knows that technical processes can put a strain on hair – no matter how skilled you are or how advanced your products are. 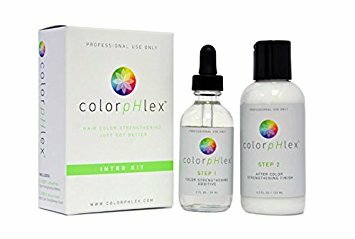 ColorpHlex is a new additive which can be added to colour to strengthen and improve the quality of hair as you work; leaving hair strong, shiny, healthy and in prime condition for colour. The reason why it works so well being added to your colour bowl, is because the colour opens you cuticle fully to allow the colour to change. ColourpHlex treatment can then follow the colour in and start to reconstruct your hair medulla through inner core to the hair follicles. Entirely free of dangerous chemicals like formaldehyde, ColorpHlex uses a naturally-derived vegetable protein molecule that penetrates the hair, reinforcing bonds to reduce breakage and improve quality. You can do two processes in one with ColorpHlex too, whether that’s toning or highlights, or even using fashion colours. Just mix in a couple of drops and apply colour as usual. Colour PHlex prices are from just £10. In French, ombré means “shade” or “shadow.” In the hair colour world, ombré is a dramatic, two-toned hair colour effect that is typically darker at the top and lighter on the bottom. Often the dark, top section is your natural hair colour shade and the bottom section is lightened with hair lightener. You can also have your Natural hair at root tinted to darken or lighten, and have toners on the ends. An ombré hairstyle can also be any colour combination—natural blonde, brown or red, or something unconventional like pink, blue, green or purple. It’s versatile, customisable and suitable for most long and medium hair lengths. A big plus with ombré hair colour is that it’s easy on the budget. You don’t have to touch it up very often since the top section remains dark. The overall look of ombré hair colour can change as your hair grows out, which many clients enjoy! In French, balayage means “sweeping.” In the hair colour world, balayage highlights are hand-painted or swept along the surface of the hair. The application begins away from the roots and gradually becomes heavier as it travels along the section, culminating in the heaviest application of lightener or hair colour at the ends. Because the hair colour or lightener is concentrated on the surface of each section, the underside remains darker, which gives the hair a very natural, dimensional effect. 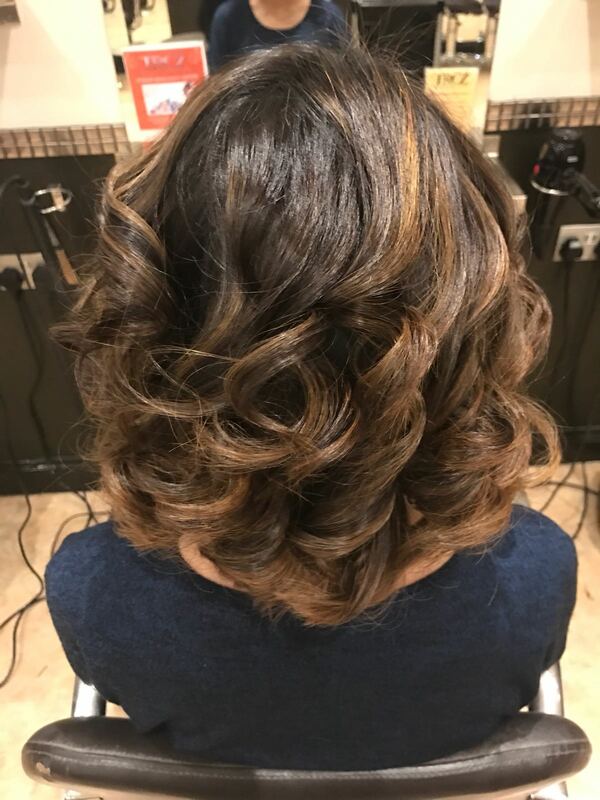 The resulting subtle balayage hairstyle mimics a natural, sun-kissed effect that has been in high demand from celebrities, models and high profile “it” girls for some time now. 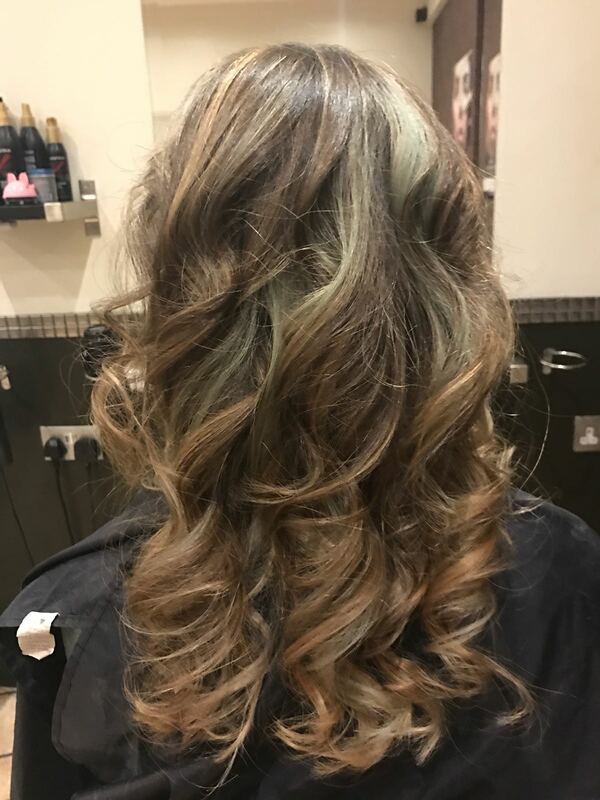 Balayage can be done on any hair colour, from blonde hair to red hair to brown hair, although it’s typically not the first choice for super dark brunettes. It’s beautiful on long hair and on medium-length hair. Like ombré, balayage highlights are cost-effective because they don’t require frequent touchups, since the hair at the top is kept darker.